Hello, dear readers. We've had a great season for fruit. The peach tree is absolutely drooping it's so loaded with peaches. 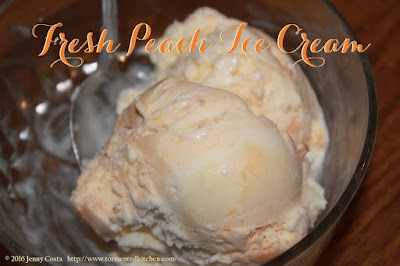 One of my favorite things to make with juicy fresh peaches is ice cream! 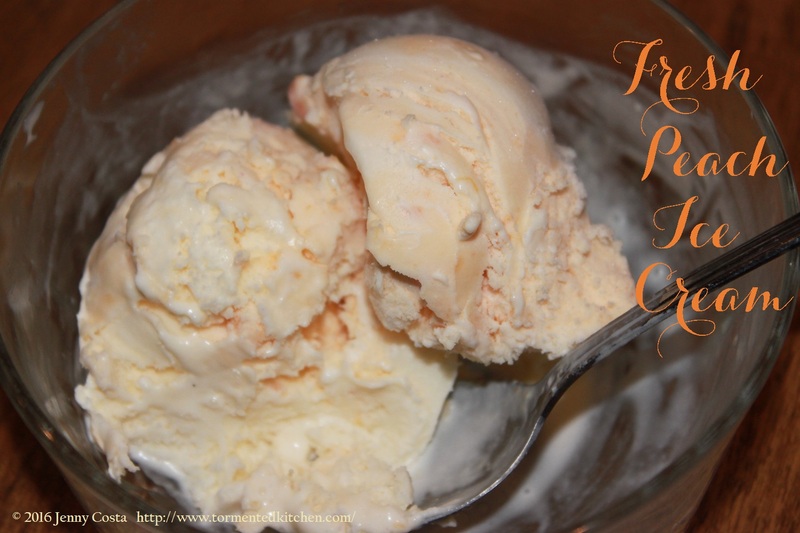 Mom used to make peach ice cream when I was a kid. It was basically vanilla ice cream with peaches mixed in. Simple enough, right? Yes, but also so good! There are two versions of ice cream base that are good with peaches. The first one is a cooked custard base. 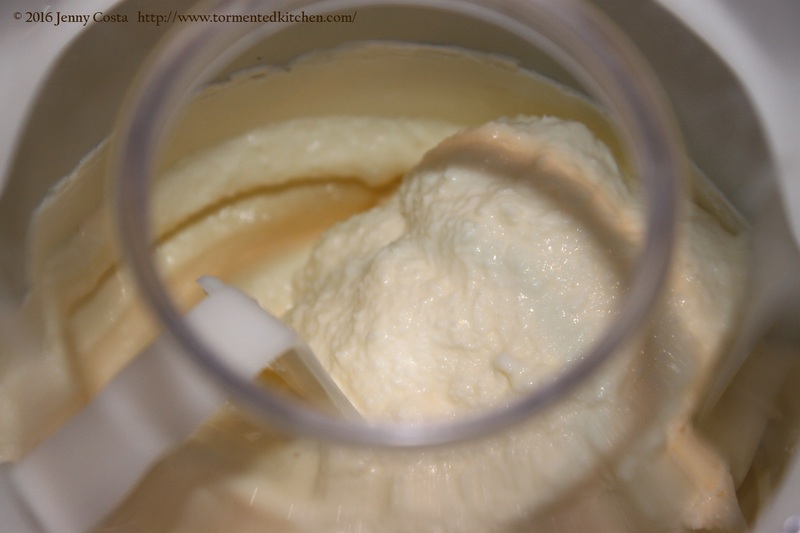 It is a richer, thicker ice cream with nice yellow tint from the eggs. It takes slightly longer to make this since you have to cook it and then let it cool overnight. It's super buttery and luscious. It freezes very hard and keeps a smooth texture. The second base is still really luscious without the cooking. It's a mixture of creams and sugar. I think I prefer this one. It's not quite so rock solid when frozen and it lends a really pure creamy flavor. The peaches really need to be ripe, dripping sweet juicy ripe, for this to be good. Slightly firm and tart peaches just won't do it justice. On a side note, I have a Krups ice cream machine. 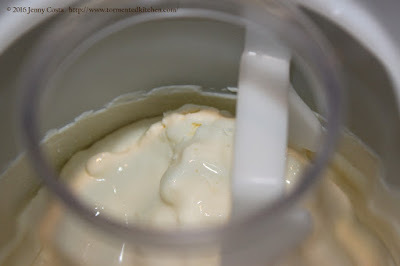 It makes a smallish batch so I have to churn and freeze the first half of the mixture, then churn the other half. It works out well enough. Just know if you have a similar machine that it will not work right if you try to freeze the whole batch of ice cream at once. 1. Prepare the Ice Cream Base in advance. Make sure it's cold. 2. 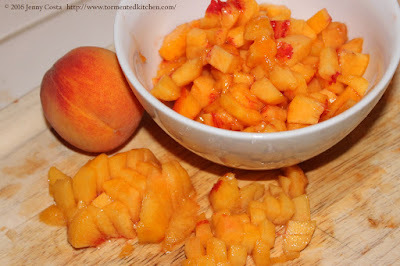 Sprinkle the peaches with Fruit Fresh and sugar. Let them get syrupy. 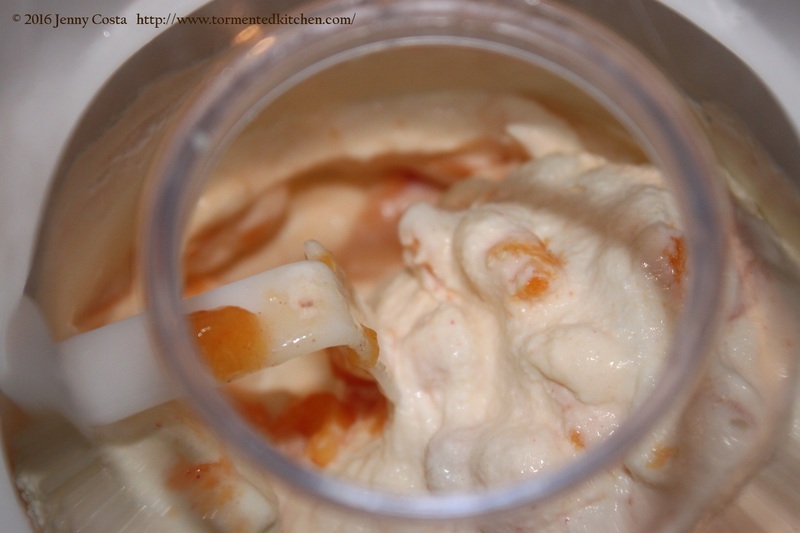 Keep this in the fridge until you're ready to churn. Cold things freeze faster! 3. 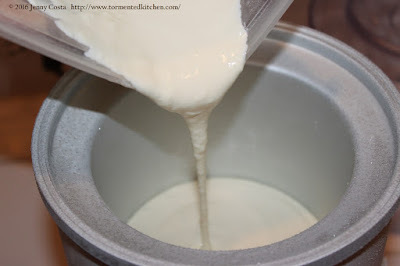 Place freezer insert into ice cream machine base with paddle and lid. Pour half of the batch of very cold Ice Cream Base into machine and turn on immediately. Keep the other half of the base cold in the fridge for now. 4. Let the machine run about 10 minutes. Keep an eye on it. When it starts to look like ice cream, let it run another 5 minutes or so. You want it pretty firm. See, just starting. It's freezing along the edges. Getting more frozen texture. It can hold a spoon standing up now. 5. Add the peaches. Yes, all the peaches. Continue churning until it looks firm again. 6. Stop the machine and scoop out the first half and place in a freezer-friendly container. 8. Add the second half of Ice Cream Base to the machine. Turn on and let it run until it looks firm. 9. When it's firm enough, scoop this into the container with the first batch. Fold them together. I like that it's not all peach all the way through, that there are some peachier flows and some creamy flows. 10. Pop the whole thing back in the freezer and consume when it's frozen hard. 1. Combine ingredients in a sauce pan. Bring up to a simmer over medium-low heat. Stir often. 2. Simmer for 2 minutes or until slightly thickened and there are no lumps. 4. Transfer to a dish and refrigerate over night. 1. Mix all ingredients while cold. Don't worry if the sugar doesn't dissolve. 2. Transfer to ice cream machine and start churning.